The wastes from the Baikalsk pulp and paper plant, including the by-products of the plant’s bleaching unit are stored in the special disposal reservoirs in the form of a sludge-lignin, which consists of lignin, polyacrylamide and flocculants. Here, we report on microbiological composition of sludge-lignin: we detected fungi hyphae, actinomycete hyphae, long and short rods as well as coccal forms of bacteria. Interestingly, despite the diversity of bacterial, cyanobacterial and fungal communities no noticeable destruction of lignin was observed. We recommend to use specific chemical compounds and microbiological agents for destruction of sludge-lignin. Argyropoulos, D.S., Menachem, S.B. (1997). Lignin. In: Eriksson K.E.L., Ed. Advances in Biochemical Engineering Biotechnology, 57. Germany, Springer, 127–158. Brunow, G. (2001). Methods to reveal the structure of lignin. In: Steinbüchel, A., Hofrichter, M., Eds. Biopolymers, 1 – Lignin, humic substances and coal. Weinheim, Germany, Wiley-VCH, 89–116. Galbe, M., Zacchi, G. (2007). Pretreatment of lignocellulosic materials for efficient bioethanol production. Adv. Biochem. Engineer. Biotechnol., 108, 41–65. doi:10.1007/10_2007_070. Danilatos, G.D. (1986). Environmental scanning electron microscopy in colour. J. Microscopy, 142, 317–325. doi:10.1002/sca.4950080104. Endo, S. (1904). Zentralbl. Bakteriol., Abt. I. Orig., 35, 109. Hobbie, J.E., Daley, R.J., Jasper, S. (1977). Use of Nucleopore filters for counting bacteria by fluorescence microscopy. Appl. Environ. Microbiol., 33, 1225–1228. Hammel, K.E., Cullen, D. (2008). Role of fungal peroxidases in biological ligninolysis. Curr. Opin. Plant. Biol., 11, 349–355. doi: 10.1016/j.pbi.2008.02.003. Jing, L.I., Hongli, Y., Jinshui, Y. (2009). Bacteria and lignin degradation. Front. Biol. China, 4(1), 29–38. doi: 10.1007/s11515-008-0097-8. counts of aquatic bacteria by epifluorescence microscopy, with reference to a new method for dyeing membrane filters. J. Appl. Bacteriol., 39, 317–329. Kersten, P., Cullen, D. (2007). Extracellular oxidative systems of the lignin-degrading Basidiomycete Phanerochaete chrysosporium. Fungal Genet. Biol., 44, 77–87. doi:10.1016/j.fgb.2006.07.007. Martínez, A.T. (2002). Molecular biology and structure – function of lignin-degrading heme peroxidases. Enzyme Microb. Technol., 30, 425–444. doi: 10.1016/S0141-0229(01)00521-X. Martínez, A.T. Speranza, M., Ruiz-Duenas, F.J., Ferreira, P., Camarero, S., Guillen, F. (2005). 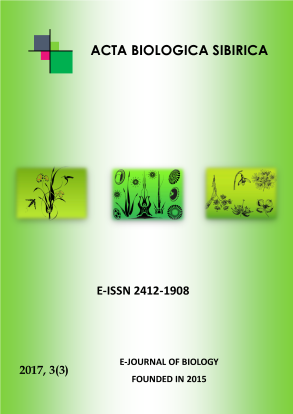 Biodegradation of lignocellulosics: microbiological, chemical and enzymatic aspects of fungal attack to lignin. Int. Microbiol., 8, 195–204. Monties, B., Fukushima, K. (2001). Occurrence, function, and biosynthesis of lignins. In: Steinbüchel, A., Hofrichter, M., Eds. Biopolymers, 1 – Lignin, humic substances, and coal. Weinheim, Germany, WileyVCH, 1–64. Ruiz Duenas, F.J., Martinez, A.T. (2009). Microbial degradation of lignin: how a bulky recalcitrant polymer is efficiently recycled in nature and how we can take advantage of this. Microbial Biotechnology, 2, 164–177. doi: 10.1111/j.1751-7915.2008.00078.x. Sixta, H. (2006). Handbook of Pulp. Weinheim, Germany, Wiley-VCH. Suturin, А.N., Goncharov, А.I., Dambinov, Yu.А. (2015). Rekultivatsiya kart-shlamonakopiteley Baikalskogo TsBK. Tsellulosa. Bumaga. Кarton, 6, 2–4.